Texas-based beach, country, pop music, featuring steel drums , steel guitar, tropical lyrics, and fiddle! "On a Beach in Mexico" features 11 original tunes from Texas singer/songwriter Jerry Diaz. On this album, Diaz continues his affinity for mixing Texas country music with Caribbean and tropical themes. The band deftly mixes steel drums, steel guitar, fiddle, and rock lead guitar throughout this album. A favorite of sailors, Parrot Heads, and beach bums from Key West, Florida to S. Padre Island, Texas, this award winning band bridges Texas and Cancun with ease. One of the best from Jerry Diaz and Hanna's Reef. Great music to relax and have fun by, whether you are or aren't actually at the beach. Enjoy! Great new CD from the Texas coast! Jerry Diaz and Hanna's Reef have a winner again! Jerry has a lot of talent in song writing. For those of us who love the beach and the island lifestyle, I strongly recommend "On A Beach In Mexico." Sound quality is great! I already have my CD and have loaded it on to my iPod. 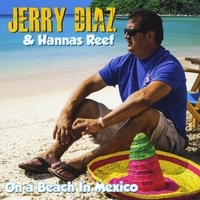 I love the new CD from Jerry Diaz and Hanna's Reef! It is a great mix of Trop Rock and Texas Beach Music. The sound quality is great.